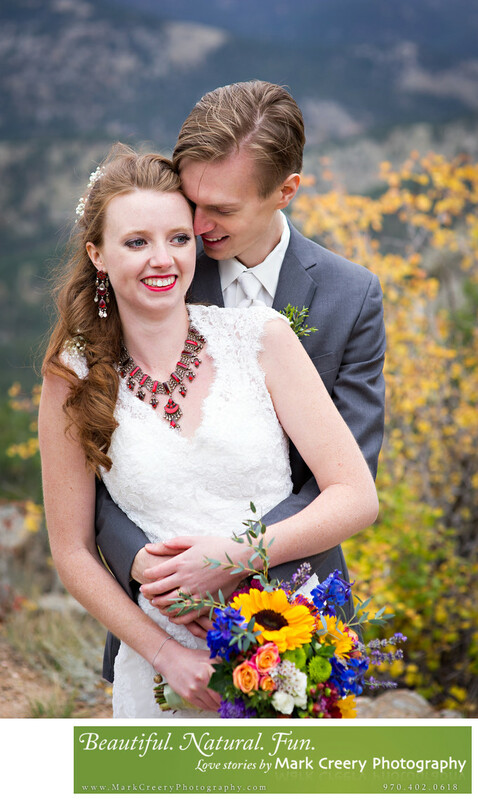 The fall colors in this wedding photo at Lionscrest Manor play off the bride's bouquet in a harmonious way. There is real joy that I feel seeing this couple so in love and connected. The bride had her own unique style and color, which also showed in her expressions. Lionscrest Manor has spectacular views of the mountains, including Mt. Meeker and Longs Peak, as well as sandstone hogback rock formations that are a hallmark of the foothills of Colorado's Front Range. The venue itself is a large Victorian Manor, with great reception views as well. There are plenty of great natural scenic spots for wedding photos. Lionscrest Manor is located in Lyons, Colorado. Contact: (303) 823-5337, events@LionscrestManor.com. Location: 603 Indian Lookout Rd, Lyons, CO 80540.